Wow, where do I start. I am still on such a massive high from the best race I have ever run and I don’t know where to start. Saturday was one of the best days of my life and one that I will never forget. 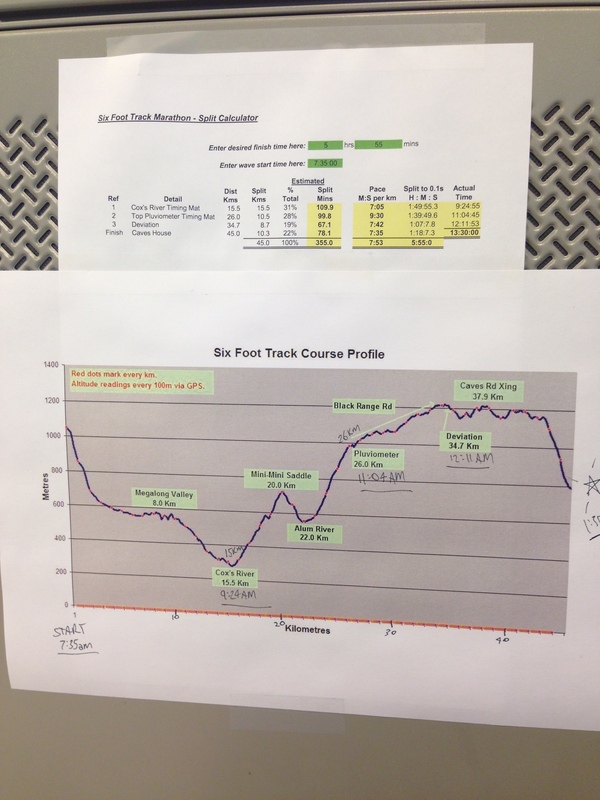 One of the things I had done in preparation for this race was to put up the elevation chart at work. I also included the splits needed at each timing mat to hit the 6 hour mark. 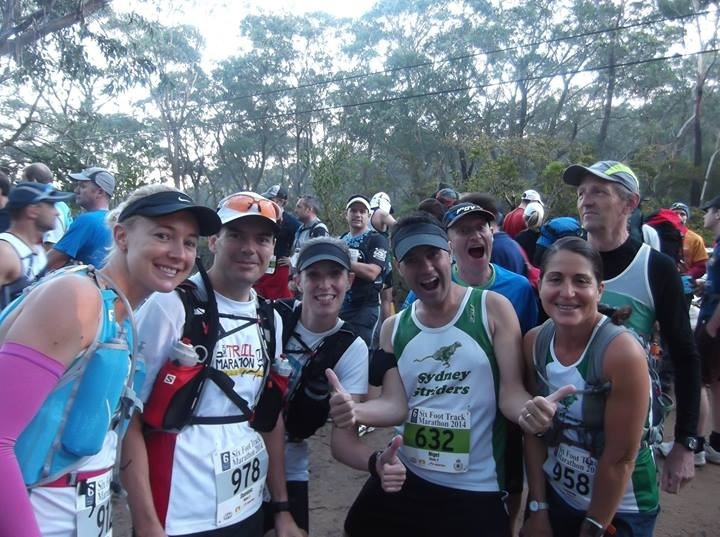 If I could beat 6 hours then I would qualify for the Mt Solitary run in April which would be a good training run in the lead up to TNF100. But honestly I would be happy just to beat the ‘Grim Sweepers’ as the cut off for this race was 7 hours. Looking at this chart every day for the past few weeks has really helped me to know the course and make it seem more familiar. 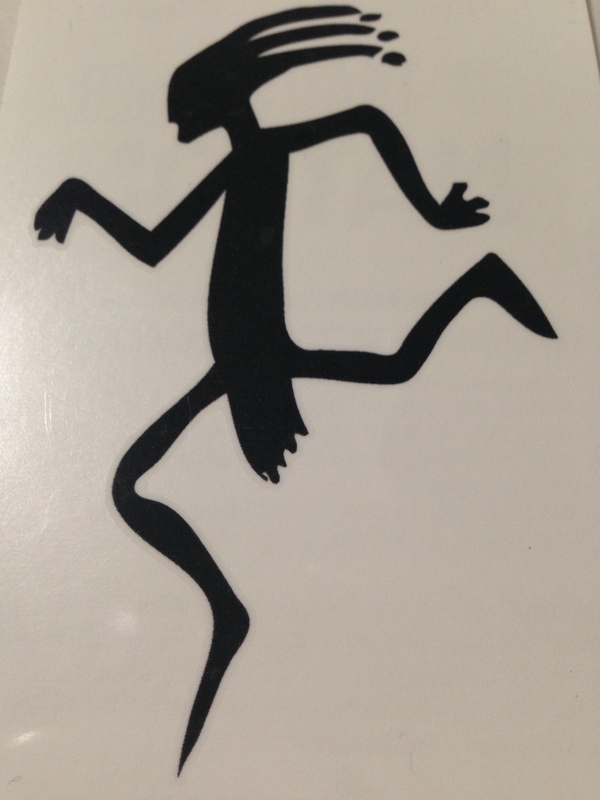 I would also like to introduce you to Kokopelli, he is the TrailRunner Nation Performance Enhancing God and he follows me on all my trail runs now. TrailRunner nation is a great site and a friend introduced me to their podcasts not long ago and they have been invaluable. If you’re into trails then you should definitely check them out. Friday morning I had a nice little sleep in and then got up and packed my bag for the mountains. I was feeling very nervous and excited but so happy that tomorrow I would finally get the chance to run the Six Foot track marathon. I met Sherin at Milsons Point around 12.30pm and we headed for the mountains. We were staying at the beautiful Carrington Hotel, which was also the location for collecting our race bibs. The Carrington is where Jared and I got married last year so it has a very special place in my heart. We arrived at the hotel, checked-in and picked up our race bibs and race shirts. I really liked the shirts and I was so excited that our names were on our bibs, I’ve never had that before! Sherin and I went for a walk down the main street of Katoomba so she could buy a jacket from the Mountain Sports store, having forgotten to bring one. And we both must have checked the Weatherzone App about a thousand times. It was raining and thundery that afternoon and into the evening, with lots of fog hanging around when night fell. At least it would be cool, I’d prefer the cool over the heat any day. Some friends of our suggested the pizza & pasta place across the road from the hotel for dinner, so we decided to head there just after 5pm as apparently it gets full by 6pm and you can’t book tables. We made our way over there at 5.15pm and the place only had a few people inside, but by 6pm it was full and there was a queue forming to either wait for tables or get takeaway. Lucky we came early! We ended up giving our table to some of our running friends so they were very thankful not to have to line up too. Then it was back to our room for some rest and chill out time to get prepped for the morning’s run. Unfortunately I had a horrible nights sleep as the pub noise kept me up and when I did fall asleep I ended up waking every 1-2 hours checking the time and feeling nervous. Oh well, not much you can do about it so no point stressing about it. In the week leading up to the race I had slept very well every night, so I hoped that would be enough to get me through. The alarm sounded at 5.00am and I made my way out of bed for a morning snack, which consisted of a mini blueberry muffin, a banana, coffee and a peppermint tea (to calm the stomach). 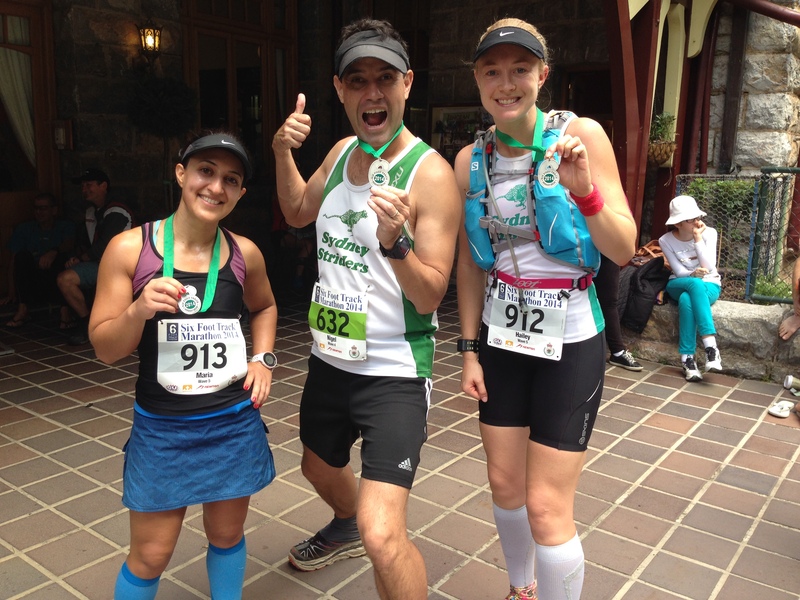 Then I got into my race gear which consisted of Nike WildHorse trail shoes, Sigvaris compression socks, BSC tights (short length), Sydney Striders singlet top, Nike sports bra and Nike sun visor. I had also decided to wear my Salomon hydration vest as it would make carrying my gels/electrolytes easy, while also being good training practice for TNF100. Sherin and I gathered our things, checked-out of the hotel and headed for the car. We drove to Katoomba High School where the buses would take us to the start line. 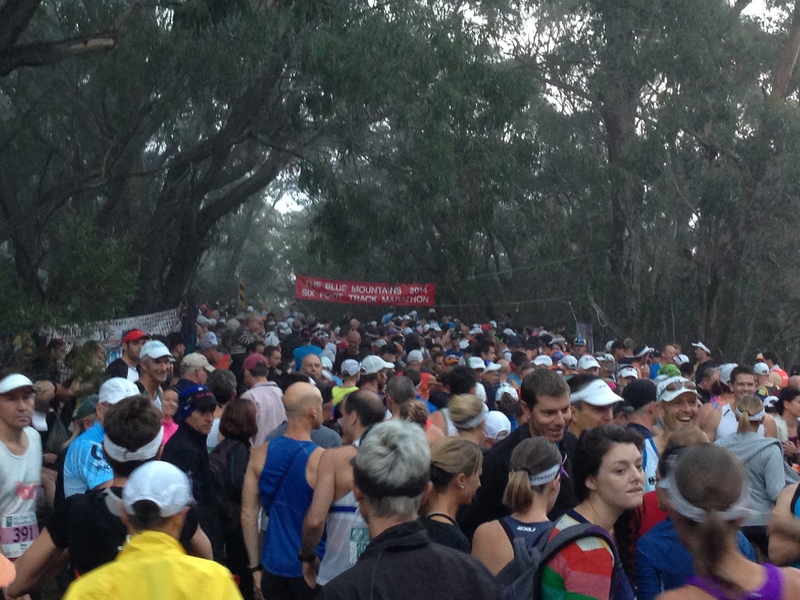 The buzz at the start line was like nothing i have seen or felt before. There were runners everywhere and everyone was smiling and excited. We ran into many of our fellow Striders and I also saw a work colleague Sam who came over to wish me good luck. Sam had been sick for a few weeks prior to the race so didn’t feel all that well prepared unfortunately. Sarah and Tanya (in the blue bibs above) were in Wave 3 and are both super speedy, Sherin was in Wave 4 (green bib) and I was in the lucky last Wave 5. We talked and laughed and the excitement was filling the air. The gun for Wave 1 went off at 7am and everybody cheered with excitement. The gun had actually been fired by Max BogenHuber, who at the ripe young age of 71 years has had the privilege to run in every race since Day 1. Max had run 30 x Six Foot Track Marathons, what a legend! As our Wave 5 readied for the start we hugged and wished each other well, it was race time! The gun went off and we ran about 20 metres before we had to slow to a walk and head down the narrow path towards Nellie’s Glen. And the pace stayed at walking speed until we got all the way to the bottom of Nellie’s Glen. The Glen is a narrow, slippery, muddy, uneven, challenging section of stairs that last for a couple of kms down the mountain. We were about halfway in the pack the going was very slow, which I thought was perfect. Perfect because this section has been known to take ankles and break bones, so my game plan has always been to take this section as slowly and carefully as possible. Unfortunately my GPS didn’t work until I was already a couple of km’s into the race, so I was a bit annoyed but wasn’t going to let it get me down. I would just have to add a few kms and about 20-25 minutes to the time and remember to do this for the whole race. At the bottom of the Glen we hit the fire trail and I got to run with my training buddy Maria. 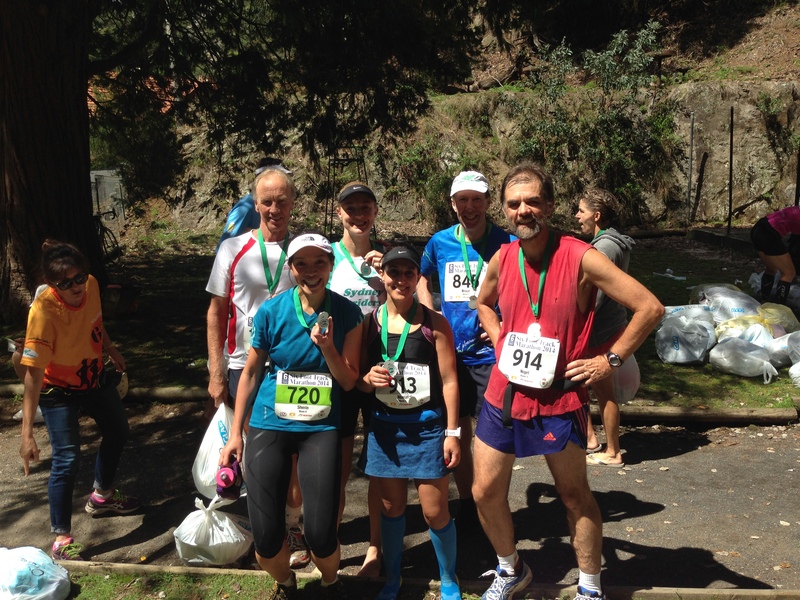 We had spent many hours together on the trails in the lead up to this race, and had qualified with the same marathon time (4hr 14mins) so we are well matched in terms of pace. 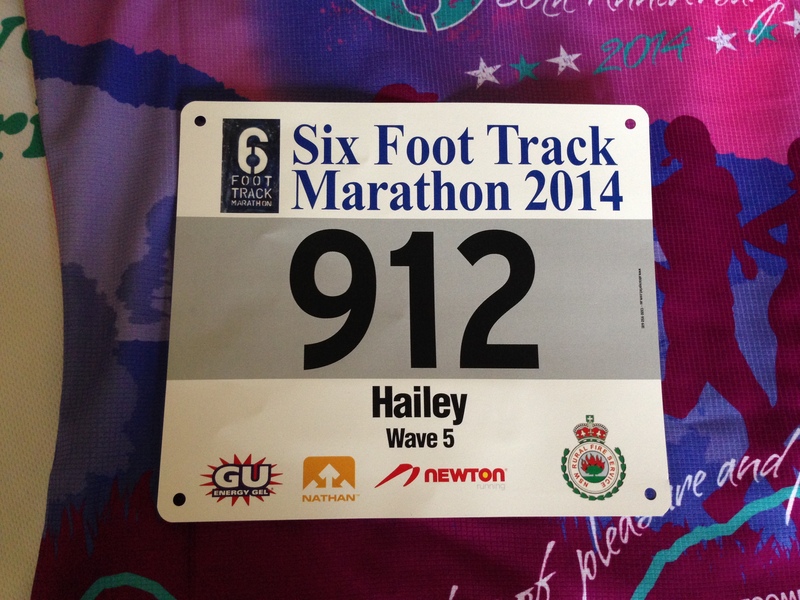 We even got race bibs with sequential numbers, i was 912 and she was 913!! I always enjoyed my runs with Maria so it was wonderful that we ended up spending majority of the race together on Saturday too. I desperately needed a toilet stop (I think it was the nerves), so i snuck into the bush at about the 4km mark and then snuck back onto the course making my way back up to meet Maria. We also had another training buddy Emma run with for some of the first section, and it was so nice to have my friends with me, supporting and encouraging each other. We talked to other runners as we ran and worked out our plan of attack for the race. Basically we were going to take it easy all the way up to the Pluviometer (26km), as that was the hardest, hilliest section of the course. Then try to run consistently through the Black Ranges, an undulating section that was mostly a slow up hill scramble. And then we would try to continue that pace, if not a little faster through the next section towards the final 2km downhill, quad killer finale. 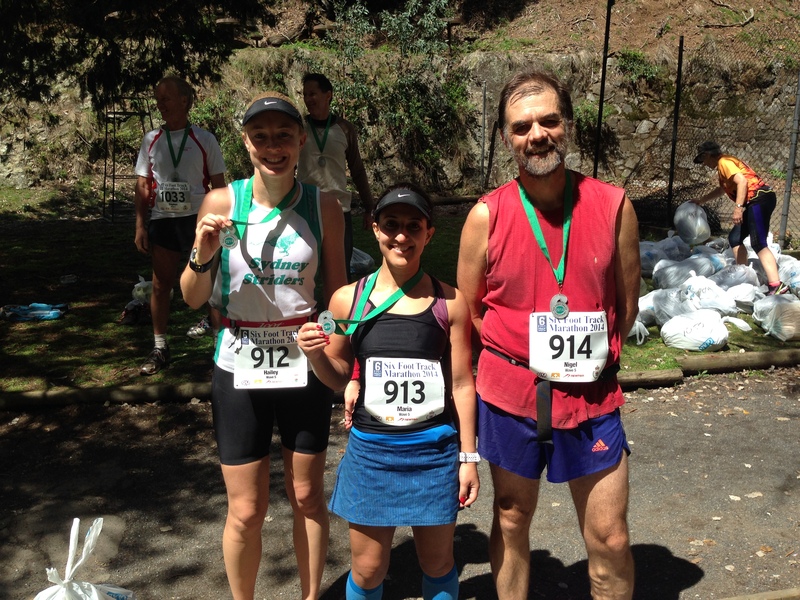 My plan was to run the whole downhill section at the end, no matter how my legs felt – I was going to run that sucker! We made our way down to the Cox’s river crossing which was the 15.5km mark and we giggled our way across the river, wading most of it as it was up to hip height. The cool water was quite refreshing on my feet and calves, and our shoes squelched as we made our way out the other side. 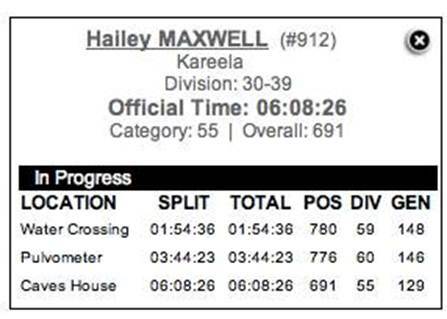 Due to the slow start and being held up by a slow group through the narrow section down to the creek we hit the first timing mat before the crossing in 1 hour and 54 minutes, and I had was the 780th person to this checkpoint. Our minds turned to the sweepers, and we definitely wanted to try and put some distance between us and them, but as we turned the corners as we started to make our way up mini mini saddle we saw the 7hr pacers from Wave 4, which meant ours were at least 10 minutes behind our position. I think this gave us confidence and we walked and chatted to those pacers as we passed them on our way up the hill. Maria was looking very strong and I new that at some stage I would have to give her a kick and tell her to leave me behind. I very much welcomed her company but there was no way I was going to hold her back! We started the next climb up to the Pluviometer and were thankful the fog had stuck around to shade us for most of this open section. The weather could not have been any more perfect. We were very quiet through this tough uphill section, but we stuck together, encouraged each other and had mini celebrations when we finally got to the peak, hitting the timing mat at 3 hours 44 minutes in 776th position (I had moved up 4 places). I should mention that we had water/aid stations scattered all the way along this course, and they were run by the local Blue Mountains Rural Fire Service (RFS). They all greeted us with smiling faces and encouraging words and I made sure I said hello and thanked every group that I passed. After all, they had volunteered there time to assist us so the least I could do was say thank you. From here I pushed Maria to go ahead of me. She was looking strong and I was feeling a little light-headed, so i told her I needed to slow down a little to get my breath back and find a comfortable rhythm. She wished me well and crept ahead as we made our way through the Black Ranges. I slowed for a few kms until I started to feel better and then decided it was now or never. There was a chance I could hit the 6 hour mark and I felt like I might get there. I ran a lot more of this section than I thought I would and I actually started to feel quite comfortable even when i decided to pick up the pace and start looking to pick off people in front of me, wishing them well as I overtook them. I found that moving at this faster pace actually felt more comfortable than walking, so i stuck with it and overtook more and more people. As I passed another water/aid station I heard my name being called, I turned around and Sam was sitting on a chair under the tent with a blanket wrapped around him, he looked very pale and told me that he couldn’t go on and that he’d had to pull out of the race. What a tough decision. He asked me how I was going and was I going to finish the race? I told him that I felt good and that ‘Yes, definitely!’ (I was going to finish the race). I kept Maria in my sights for most of the last section, but I did not catch her. I did catch up to a few people i knew from our weekend training runs and had a chat with some fellow Striders. Plus I ovetook my friends husband Craig who told me I wasn’t allowed to and we had a laugh!! I was smiling from ear to ear and nothing, no run had ever felt like this. It’s hard to describe, but I felt so comfortable and so right being there in that moment, in that race, at one with the world. It felt like I was exactly where I was supposed to be, doing exactly what i was supposed to be doing. I had caught up to a few friends Leonor and Margaret, and we spotted the Pine forest ahead – the Black Range was over. Then on the side of the trail I spotted Anne, a friend from work and also an avid runner who has given me great advice and encouragement in the short time that I have known here. I gave her a huge hug and she wished me well. There wasn’t far to go now. 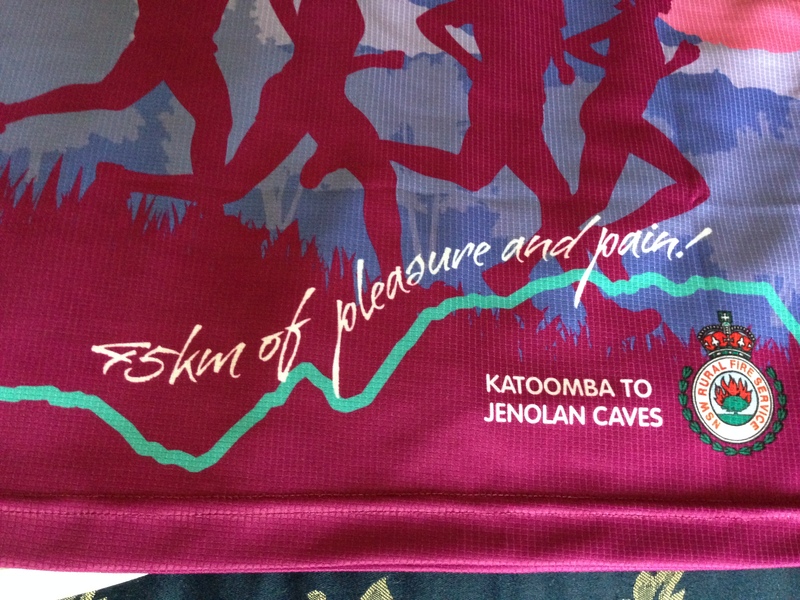 At the Caves Road Crossing (38km) I saw a sign for the Jenolan Caves and I burst into tears…. I was really doing this. 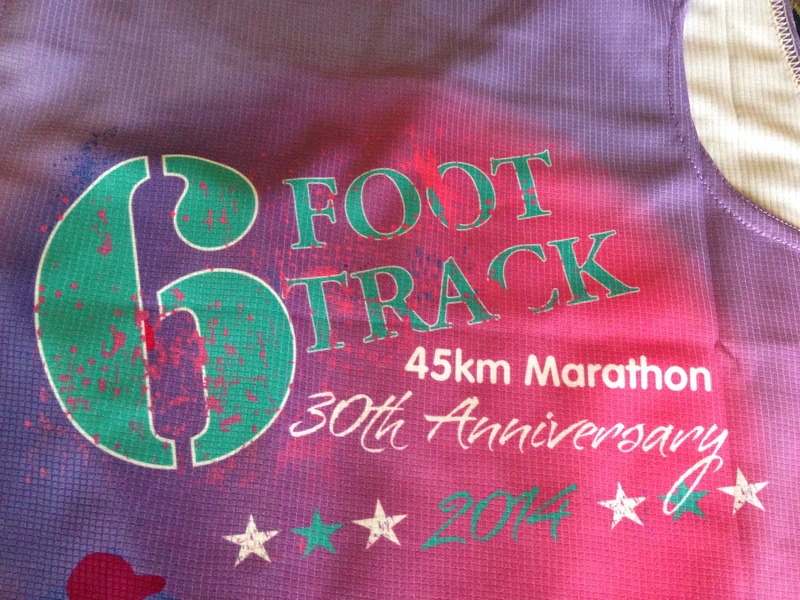 I was going to run 45km, the furthest I had ever run and on the toughest course I have ever seen. I had to get control of my emotions, so i used them to pick up the pace and I don’t know how it was possible, but my mood shifted up another gear and I felt amazing. I kept moving forward and over taking more and more people. Lots of runners told me I looked great and to keep pushing and one lovely old man yelled at me telling me I looked like I was flying. The energy in his voice was so powerful, I will never forget that moment. The downhill section had begun, the rocky, dusty path near the end was before me and I kept running. I shortened my steps and stuck to the technique that I had been taught for downhill and I kept the speed up. I saw others walking in front of me and I caught them quickly. And then I heard it….. I heard the crowd and I burst into tears. I could see the cars as I peered through the trees and I knew I was on the final descent down to Caves House. The terrain turned into a flat concrete path which required hardly any focus, so I decided to give it everything I had left. I increased my stride length and sprinted down those ramps, zig-zagging my way to the last set of stairs and rounding the corner towards the finish line. I sprinted over the line in 6 hours 8 minutes in a position of 691st, which meant I picked up 85 places from Pluviometer to the finish line. How awesome is that?! 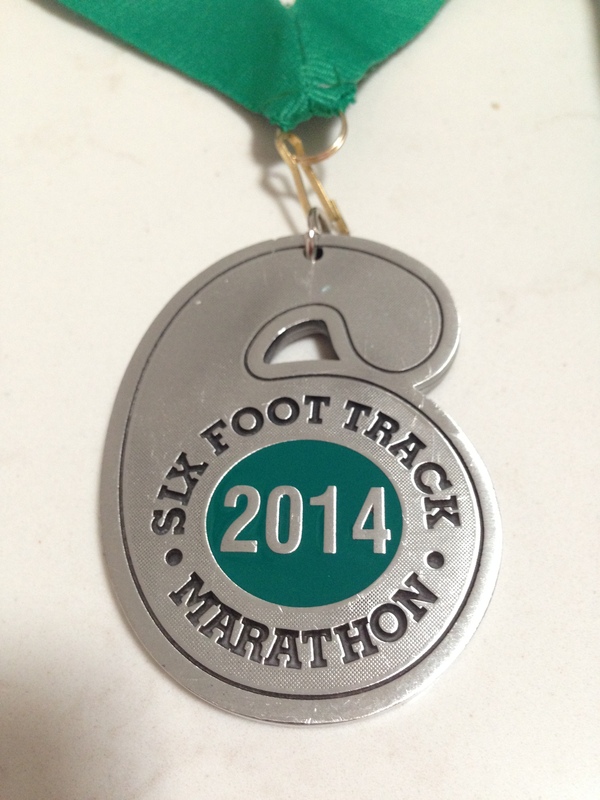 My medal was placed around my neck and the next 10 minutes are a bit of a blur to me. I hugged many of my friends and we all shared our results and experiences. It truly was the best race of my life and I cannot believe the high that I was on. Here’s a shot of Maria, Nigel and I with our winning medals and grinning faces! 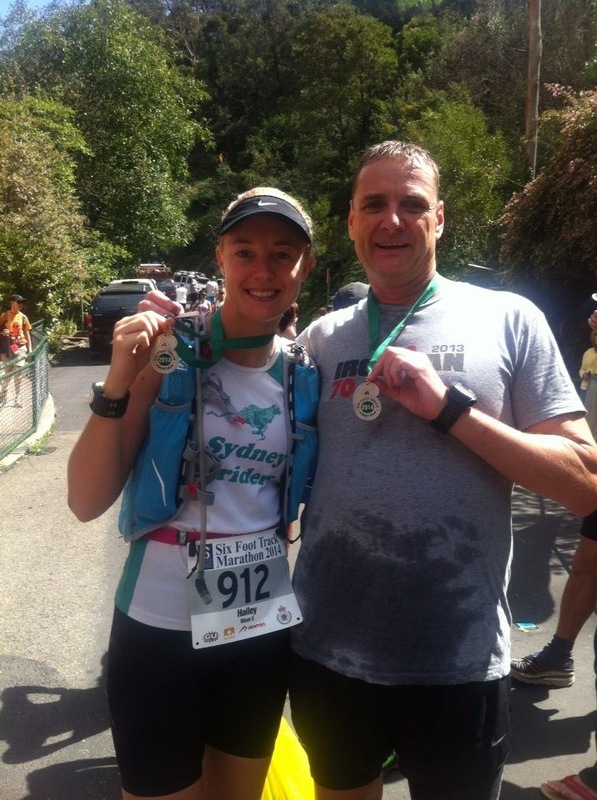 I ran into David from the Find Your Feet training camp in the Blue Mountains that I had done a couple of months ago and he told me that Hanny Alston (my mentor) had won, so i raced over to wish her Congratulations (she had also finished in the 2nd fastest time ever!). I also bumped into Julie (David’s wife, who I had also met at the camp and run many trails with) and she gave me a big hug as the tears ran down my face. Later I found out that she had come third, what a legend – I wish I had given her my congratulations at the time but I was so emotional when I saw her that I forgot to ask how she’d gone. Silly me!! I saw Mark from work who had successfully finished the race, and had a photo with Craig (below) who had also had a great run! The noise and the atmosphere in that finish area was like nothing before. Very powerful. We watched more and more people cross the finish line, cheering them as they finished and eventually the sweepers crossed the line just after the 7 hour cut off. It was all over and i felt a little sad for all the people who hadn’t made it to the line that day. I started to feel a bit light headed and decided that I should sit down for a while. Maria grabbed us some salty hot chips (yum) and a beer, while I got some water and electrolytes into me. We managed to secure some chairs and eventually a small group of us gathered there to chat and celebrate. What a magical day. It truly was the best organised race, on the best course I have ever run. I have never enjoyed myself as much as I did on that run, for the entire run and I couldn’t be happier. If you are considering entering this run, don’t even think twice – just register, as you will not be disappointed. Happy (trail) Running 😀 !! 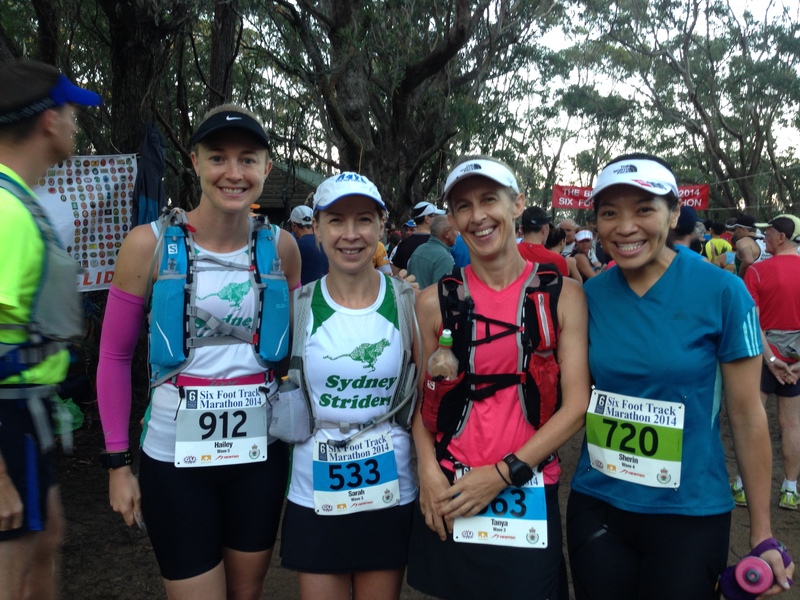 This entry was posted in Race Days and tagged #running, 6foottrack, bluemountains, marathon, sixfoottrack, sixfoottrackmarathon, trailrunning, ultramarathon by laurenhailey. Bookmark the permalink. Sounds like you had an amazing time! Congrats! Sounds like it was wonderful! Congrats! !